This entry was posted in Home Decor, Home Improvement, Interior Design. Bookmark the permalink. Whether you are looking to tear down a wall and open up your space, or just freshen up your existing kitchen with a coat of paint, here are some great tips you might want to consider. There’s a reason why you are remodeling your kitchen – something about the space just isn’t working. What are those ‘somethings’. Grab a pen and a piece of paper and begin to list the things about your kitchen that you dislike. Maybe the flow of the space doesn’t work well for you, or maybe you dislike the countertops and hardware; whatever it may be that has you considering a remodel, write it down. But don’t forget to list the things you do like about your current space as well. Keep in mind nothing is too small or minimal to list. If you like that your silverware drawer is close to your sink, write it down. If you find having your microwave above your range is convenient, write it down. This list should be something that helps you build, or rather rebuild, the kitchen of your dreams! Everyone has different ideas when it comes to design and style – that’s what makes a space your own; your personal taste. Keep in mind that the kitchen is the heartbeat of the home; it’s often the daily gathering place for family and it should reflect the family who lives there. So what does your kitchen say about you? Does it reflect your style? Do you prefer rich warmer toned cabinetry with a complimenting light countertop? Or are you drawn to brighter white and cream colors in a space? Whatever your style is – it’s never wrong. You don’t want to recreate your neighbors kitchen, unless of course your neighbor just remodeled their space after picking your brain for ideas! Remember your kitchen is your own. If you prefer hardwood flooring over tile, go for it! If you want an island where the family can gather or you prefer to keep cabinetry and countertop along the walls, go for it! The worst mistake you can make is to fashion your space after another persons taste. Size matters. In the case of a kitchen remodel the size of your space will only allow you to do so much. At times that can be a good thing, especially if you’re one who finds no restrictions overwhelming. There are several spacial things to keep in mind, such as; walkways need to be 36 inches minimum and up to 48 inches for comfort of multiple chefs in the kitchen. Anything greater than 48 inches and you might want to consider investing in a good pair of walking shoes, because you’ll be doing a lot of it! Keep in mind too the height of your ceiling. If your ceiling is 8 feet and you are looking to purchase wall cabinetry that is 42 inches high with additional two-part crown molding, than you will be in for a surprise when you run out of vertical space. Every square inch of a kitchen is important, especially when it requires setting cabinetry an countertops in place. As the old saying goes, "measure twice, cut once". The way you work in your kitchen is very important. Do you find yourself spending more time at the sink doing dishes and washing off fruits and veggies, or do you prefer standing at the cooktop whipping up your favorite dish? 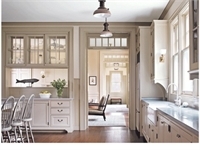 Remember the kitchen is your own and when remodeling you should make adjustments that will make life a bit easier. For instance you may find it handy to place a spice cabinet near your cooktop, or a pull-out waste bin directly below your pull-out cutting board. And if your children like doing their homework at the counter, you may want to designate a drawer nearby for extra pencils and paper. Keep in mind how you like to spend your time in your kitchen and find ways to make your new space more convenient for you and your family. Keep your list handy and prepare to shop around (via the internet or your neighboring construction warehouse). There are always deals to be found if you have the time, and if you don’t, one last thing to consider may be to call in for back-up; hiring a designer to help make your dream kitchen a reality. But remember… it’s still your space!